James' Empty Blog: That's told them! Anyone looking for some Friday afternoon fun need look no further than this. Apparently Halpern et al were completely incorrect in their slap-down of Gerlich and Tseuschner. How can we tell? Why, Gerlich and Tseuschner have told us themselves, with ... a manuscript on the Arxiv. 41 pages, eh? They'll have to boil it down a bit if they hope to get it into _Nature_. This is simply a copy of the "reply" that was published in IJMP at the same time as our rebuttal. It's extraordinarily silly. > simply a copy of the "reply"
Verbatim, no subtle change anywhere? oh, no, no x 10e3; I'm sure someone must have software for that. Maybe one of the plagiarism detection programs? Well I have UltraCompare, but navigating these science journal websites is rather like navigating the parts of Japan that have no romaji on the signs. By which I mean I can easily get to the (possibly) new paper, but how do I find the old one? Not reaching extraordinarily silly levels but just wondering if you have looked at Zhang et el. I get the impression James doesn't like things being presented as if they are a realistic projection if they aren't really realistic. Also reading the abstract alone would probably give impression that paper supports James is likely to win his arctic sea ice bet against J Romm. The abstract makes claims about SATs/Climate variability being similar to the past two or five decades. However it appears to me that very dramatic cooling has been applied in 2010. For two scenarios taking SAT back to the level of a randomly picked year in 1948-2009 (2C cooler) and in the other two to a randomly picked year in 1989-2009. This doesn't seem a similar level of variability nor does it seem a realistic forcing. Taking about a 4C increase by 2050 without mentioning a 2C cooling in 2010 doesn't seem to paint the full picture to such an extent that the first four sentences (possibly more) could be considered misleading. To me very low levels of summer sea ice seem to follow shortly after current temperatures are reached. Lower levels of ice without SAT reaching current levels might make such a conclusion rather dubious and I see the large cooling being a distraction from being able to reach conclusions rather than helping. Am I being overly harsh on this paper? Sorry for the bad timing of my question. Probably best to ignore me anyway. But I should probably make clear I do not have a problem with them doing control runs which shows the model tends to underestimate the amount of ice. 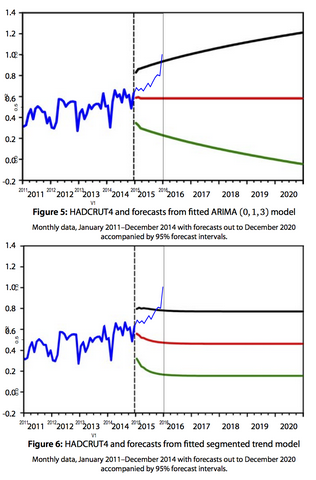 It is the spill over into predictions about the real world 2050 without appropriate caveat like mentioning the large cooling imposed that is unlikely to happen.